Once you start reading this book, you won´t be able to put it down. 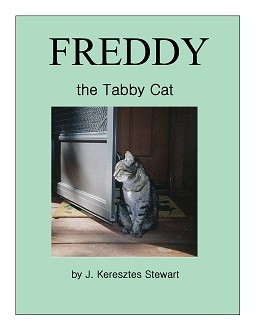 It is based on real life events and true stories about Freddy, a tabby cat from Southern California. The story starts with that dreadful day when Freddy was taken away from his beloved home in the San Fernando Valley against his will. Freddy finds himself in a crowded apartment complex in Santa Monica, where he has to share his habitat with other cats. At first he rejects his new environment, including Jen (his new human), and tries to escape, but he changes his mind after he meets a friendly black cat named T-bone, who talks him out of running away. Slowly Freddy gets used to his new environment. With time he becomes best friend with T-bone, survives a vicious cat fight with Dingy Cat (the menace of the neighborhood), gets smitten by Daisy (a young cat living next door), and there are many other exciting events happening during that year. As we follow Freddy´s path, we can find out how he sees the world, how he feels, and what he thinks about us, humans. While the season changes there are some important events happening in Jen´s life too. She gets married, and the two of them buy a new house. Freddy once again finds himself in a new environment, far away from the neighborhood that he learned to love so much, and far away from T-bone and his other cat friends. This book is full of adventures and suitable for kids of all ages, as well as for adults.